A petite sterling silver ring with 14k gold filled beading. Handmade to stack perfectly with other rings. Sterling silver vintage style heron ring. Oxidized and polished to bring out the fine details in the wings. This ring features a rose cut (top faceted) gemstone. 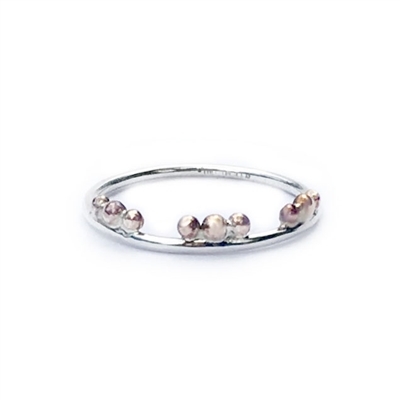 The flat sterling silver band allows it to easily stack with other rings. Made to wear alone or added to a set for layering. A sterling silver adjustable snake ring. Oxidized and polished to bring out the fine details. Adjusts from size 5 - 8. A sterling silver ring of a half moon and bezel set gemstone. Oxidized and polished to enhance the details. A sterling silver band of leaves and two small bezel set gemstones. A sterling silver ring with a filigree infinity design. Oxidized and polished to bring out the fine details of this vintage design. Small oval (7x5mm) gemstone sterling silver ring. Shown in opal triplet and available in many stone varieties. Sterling silver wrap ring with two bezel set gemstones. Sterling silver vintage style ring with rose details on either side of a bezel set gemstone. A sterling silver ring with a prong set faceted natural gemstone. Oxidized and polished to enhance the fine details. A Victorian style sterling silver ring with tiny seed pearls and a bezel set (3mm) gemstone. Oxidized and polished to enhance the details. A bezel set gemstone is held between two sterling silver bands. An intricate snake in sterling silver is coiled around a natural gemstone egg. A sterling silver ring with fine silver details. Oxidized and polished to enhance the design. A sterling silver ring with a natural aquamarine. Each naturally shaped aquamarine has been polished smooth. Each stone is about 1/2" inch. 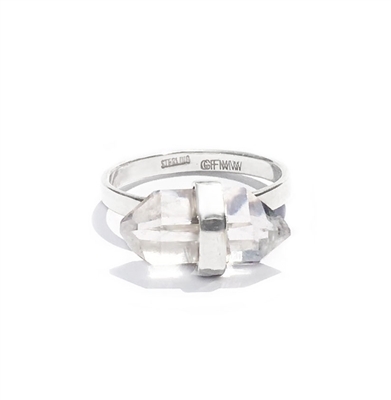 A sterling silver ring with a natural Herkimer diamond. Each naturally shaped Herkimer has double points. Each stone is about 1/2" inch. Sterling silver ring with bezel set cabochon gemstone between two round bands. 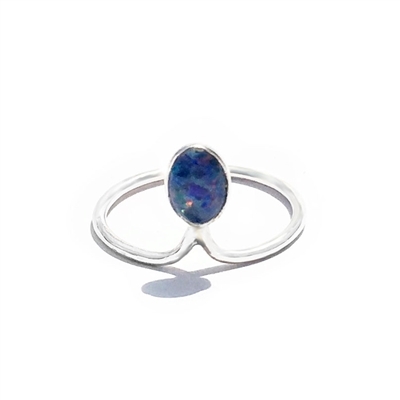 A sterling silver ring with a slender bezel set gemstone. 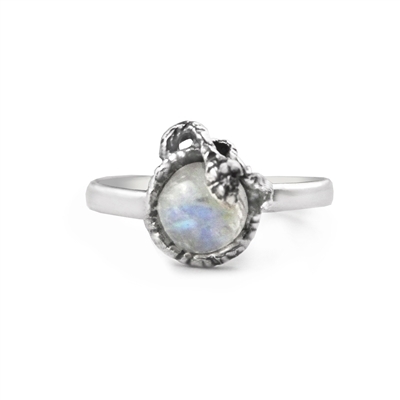 Sterling silver ring with a bezel set bright and round rainbow moonstone. A vintage and classic sterling silver ring with rose details and gemstone cabochon. 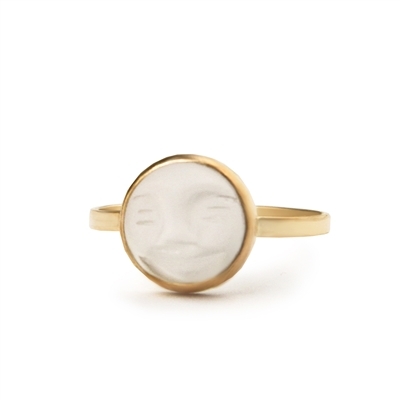 A limited edition 14k gold filled ring of a vintage carved rock crystal moon face. A sterling silver ring with a bezel set gemstone cabochon. A vintage style sterling silver ring with bezel set natural gemstone cabochon. Oxidized and polished to enhance the intricate silver rope and bead details. One of our classic rings featuring a prong set natural gemstone. Oxidized and polished to enhance the intricate details. Each gemstone is faceted except for in white opal. 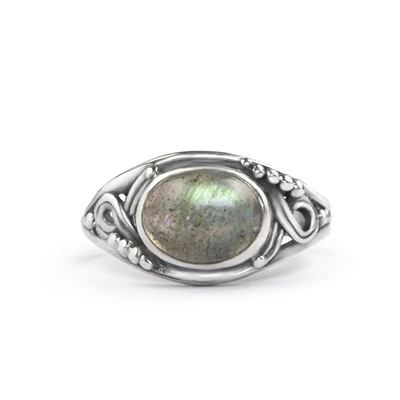 This sterling silver ring features a flat band and narrow gemstone. Perfect for stacking together or with other rings. Available in Australian opal or Peruvian opal. A bezel set ring with a framed teardrop shaped gemstone. Each stone is 16mm (1/2 inch). Shown in kyanite. A sterling silver ring of natural turquoise. A sterling silver bezel set rose cut (top faceted) gemstone ring. 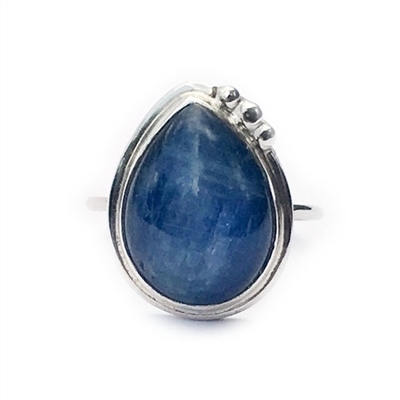 A sterling silver ring with a soft cushion shape faceted gemstone.